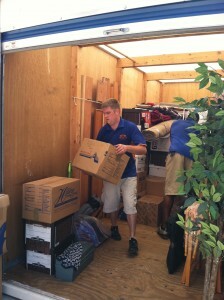 As of March 2012, All Metro Movers has closed its doors. Great Day Moving is now providing award-winning moving services to all past and current, loyal clients of All Metro Movers. Let us know how we can help with your upcoming relocation! Roger Lee Ward III and his wife, Dana, founders of Great Day Moving®, are no strangers to hard work and dedication. As military veterans, they are no strangers to relocation. They are dedicated to hiring the right movers. They gained this skill by being military veterans. Due to Roger’s service-disabled veteran status, Great Day Moving is now officially certified by the Center for Veterans Enterprise as a Service-Disabled Veteran-Owned Small Business (SDVOSB). Call us today to learn about our team of movers! Three years before the Wards developed the Great Day Moving® franchise business model, they purchased a local moving company called Marathon Moving & Delivery LLC (MMD). Upon purchasing MMD, they promptly tackled the company’s lack of infrastructure and created a more organized team of movers. Within a few short years they had created a system for the local moving industry to succeed using technology, which allows for the efficient completion of moving services and enhanced accountability to the client. MMD has now become the first Great Day Moving franchise serving the Johnson County, Kansas area. Other area franchisees are being established. The Great Day Moving® franchise system is a veteran-owned company. Among the large number of awards Great Day Moving has received in the past, in May of 2011 Roger was honored with the Small Business Administration’s 2011 Region VII Young Entrepreneur of the Year Award, attesting to our commitment to excellence in all moving services. Relying on MMD’s positive and strong community involvement, Great Day Moving® will continue partnering with local organizations such as the Special Olympics Kansas, Friends of Overland Park Arts, Patriot’s Run, Oz Marathon, Operation-Give-A-Bear, Marillac Center, and American Heart Association. Our movers care about giving back to the community. Our moving teams are dedicated to providing outstanding moving services to the Kansas City metro area to include the Lee’s Summit, Independence, and Grandview areas. When you need a reliable local mover to assist with your next relocation, be sure to call Kansas City’s best professional movers!